The problem with zombies, according to zombie movies, is that there are far too many of them and it’s far too easy to make more of them. The same could be said for zombie movies themselves, unfortunately. Since the zombie movie became a genre unto itself, most zombie movies have taken on the characteristics of their stars – shambling, predictable, brainless and indistinguishable from each other. Lurching alongside the rest of the pack is “2012: Zombie Apocalypse,” which couldn’t be more generic if it came in a brown paper wrapper. Even the title suggests that you won’t find anything in it that can’t be found in dozens of other movies. It’s actually surprising to me that this is a SyFy Original movie, because SyFy has shown at least enough creativity to smash two toothy animals together into one CGI beast to chase Debby Gibson or Jimmy Walker. All zombie movies owe a debt to George Romero, creator of “Night of the Living Dead” and its growing list of sequels. But the best of those movies only used zombies as a means to an end, with the living dead used as a device to explore the way we live and die. In the 70s and 80s, a wave of imitators followed. No one would accuse the “Return of the Living Dead” series of having anything to say about the human condition, but they had fun with the zombie concept in a way that makes them enjoyable to watch. Ultra-violent European exports toned down the social commentary but compensated with intense levels of violence and gore. There have been zombie movies since then that have done interesting things with the genre, like “Shaun of the Dead” or “Fido” or “Zombieland.” Like Romero’s best, these movies use the zombie apocalypse as a starting point and build meaningful stories rooted in character and emotion. The rest, like “2012: Zombie Apocalypse,” are locked into a mindless formula that dooms them to repeat the same meaningless actions over and over. That skeleton of an idea is spotted with rotting masses of clichés that should be familiar to anyone who has seen more than three zombie movies in his or her life. Will one survivor insist on going back for her friend who has just been ravaged by zombies and left bleeding out on the street? Will one be bitten by a zombie and hide it from the rest of the group, putting them all at risk? Will one character inexplicably forget everything he knows about avoiding zombies and run blindly into danger for a stupid reason? Will one character be bitten and tearfully demand his friend kill him before he turns? Will the characters yell things like, “Move!” and “What was that?” These are rhetorical questions, of course. The formulaic nature of “2012: Zombie Apocalypse” and its ilk is due to one simple difference between them and the best zombie movies – they’re more concerned with how people survive the zombie invasion than why. 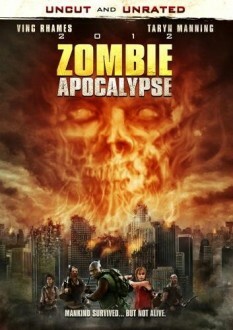 Movies like this spend more time discussing the various ways to distract, kill or avoid zombies than they do giving its characters a reason to do so. One of the main characters of “2012: Zombie Apocalypse” spends as much time explaining why she needs someone to watch her while she urinates as she does talking about her missing husband. There’s a long scene in a sporting goods store where the characters discuss the proper way to shop for body armor. The merits of a bow and arrow versus firearms are discussed at length. One character lectures another about the dangers of riding a bicycle. Rules for fighting off zombies are dropped into the story and then never used again, like the fact that zombies are attracted to air horns, or that they will swarm a freshly-killed zombie. It ends up feeling more like a post-apocalyptic public service announcement than a movie. And yet, “2012: Zombie Apocalypse” can’t even stay committed to that. 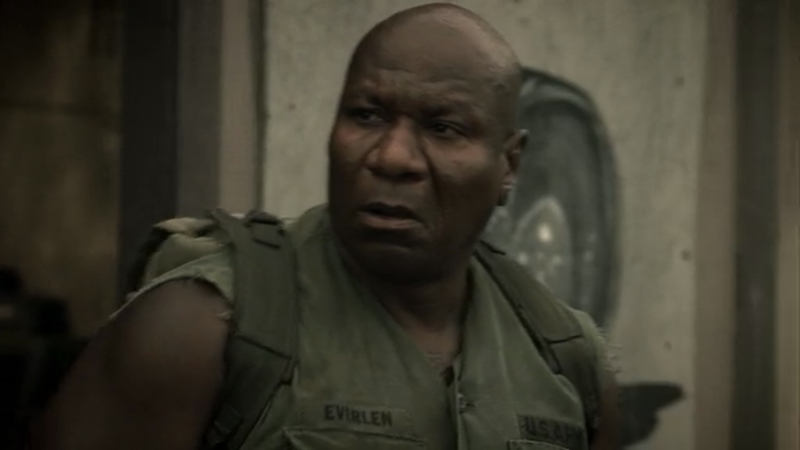 For a movie that spends most of its running time obsessing about the minutia of surviving the zombie horde, “2012: Zombie Apocalypse” is extremely inconsistent with how it treats its monsters. 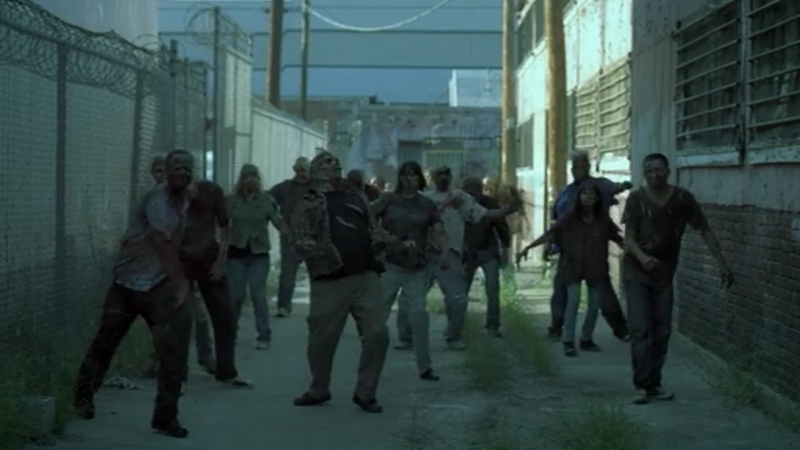 The characters talk about a hierarchy of zombies, with “runners” supposedly the most dangerous of all. But as the movie goes on, it’s clear that all the zombies pretty much travel at the same speed, which is just fast enough to stay a few steps behind the heroes. Other zombies show the ability to shrug off a blow to the head with a sledgehammer and call for reinforcements, but these abilities don’t rate a mention from the supposedly zombie-savvy survivors. The events hint at a sort of zombie evolution, but it’s quickly forgotten about. Then again, maybe the movie’s heroes all suffer from short-term memory loss. There’s certainly enough evidence to suggest that sporadic amnesia might be one of the zombie virus’ symptoms. Early on, the characters stop to ponder the burning L.A. skyline, noting that everything has been burning for months. But later, they come across a burning house and investigate it as if there might be other survivors inside. Naturally, they mistake a zombie for a living person, which is not the kind of mistake you would expect from people who apparently are writing a field guide to the North American Zombie. One character later rushes joyfully to a port-o-potty and flings the door open carelessly only to find it occupied by – wait for it – a zombie. A movie as painfully anonymous as “2012: Zombie Apocalypse” needs to latch onto any gimmick it can muster, but the movie’s only meager stab at originality fails as badly as the rest of it. 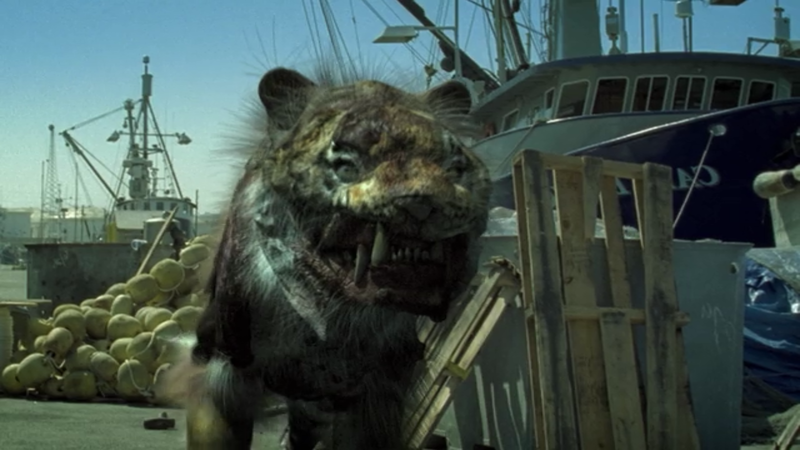 Just as the survivors reach the docks, they discover a pair of zombie tigers prowling the area. A few of the heroes are chewed on before the decaying cats are dispatched, and the remaining survivors are left to await the ferry that they believe will take them to Catalina Island and safety. Few movies are willing to tackle the question of whether or not animals are affected by the zombie plague, probably because it’s a nightmare to stage. Fighting off several million zombie humans is bad enough, but if zombie dogs, birds and cats were added to the mix? That’s to say nothing of zombie bugs, who would outnumber any survivors by billions. “2012: Zombie Apocalypse,” true to its nature, introduces the concept of zombie animals and then quickly does away with it. It’s as if the movie wants to goad someone else into making a better movie with these ideas. It wouldn’t be hard to do. This entry was posted in Bad Movie Reviews and tagged bad movies, movies, mst3k, mystery science theater 3000, netflix, terrible movies, ving rhames, walking dead, zombie tiger, zombies by splintchesthair. Bookmark the permalink.